Hoi An was great. The hotel was a great return to the easy life. There were backpackers everywhere, and a cafe/restaurant on the grounds. With the grounds walled, and an attendant at the entrance, it was possible to sit outside and read, or even daydream, without drawing a small crowd. The town was equally refreshing. There was a post office and bank just around the corner from the hotel, an 'old town' of narrow winding streets just a few blocks away, and a beautiful beach 5 k away. That evening I ate in the town center. As I was leaving the restaurant, the proprietor gave me a guest book to sign in on. I told him I was from America, and he asked me if I knew the person who signed in two pages earlier. There, dated January 4th, was "Bobby Weir, Mill Valley, California". I guess that helps explain why the Grateful Dead didn't do their traditional New Year's Eve show. 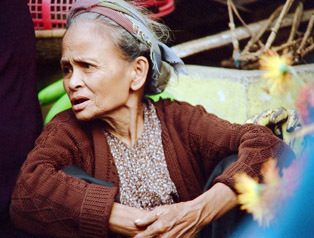 I ended up spending two full days in Hoi An -- my longest stop on the trip. I took a motorcycle out to the Cham ruins, a few hours away, and reveled in the remains of a culture more than a thousand years old. I visited the beach and caught up my journal, and I spent time at the harborside fish market, soaking up the sights and photographing the endless activity. Hoi An was a town where I could have stayed a week or two. Da Nang was 27 k north, 37 when you included the ride back out to the main road. I'd heard that there was no real reason to stop there, and my target for the day was Lang Co, about 30 clicks beyond Da Nang. A 67-k day was no big deal, but there was the Hai Van Pass, requiring a 1600' climb. Even Michael, my "Hey, it's easy!" consultant back in San Francisco, had commented that this pass was "something." I had planned for this day. In my bag was two feet of elastic cord, tied to a piece of heavy-duty string, tied to a nail, bent back into a hook. My plan -- to hook a slow-moving vehicle and get towed up the mountain. I started off early, since I had a few to-do's. Before even hitting the pass, I wanted to visit Da Nang's Marble Mountain, and I needed to start thinking about extending my visa, which required a stop in one of the major cities. I was at Marble Mountain by 8:15, and after touring the five stone hillocks, I was off to the city. I'm in the center of Da Nang by 10:15, and decide to try finding the immigration office, to renew my visa. The hotel in Hoi An had given me an address, and I find the building, but the visa office doesn't want to deal with me. Apparently this location doesn't deal with individuals. The man is unwilling to offer a solution, and I decide to ask at a hotel. This approach works, and eventually I'm at a police station of some sort. The staff was willing to help. I had heard stories of paying $15 for a stamp that carried no weight whatsoever when it came time to exit the country, but there wasn't much I could do. I was polite; they were polite, and $12 later I had a small green stamp on the back of my existing visa. The official also suggested a restaurant right around the corner that was very good, and I decided that I didn't really care if the stamp was useless -- the guy had been so much nicer than that first bureaucrat I had to deal with. I ate a good lunch, then headed back out of town and rejoined Highway 1. It started to drizzle, and I rechecked my baggage, making sure the camera, extra lens, and exposed rolls of film were each double-wrapped. The market at Hoi An. 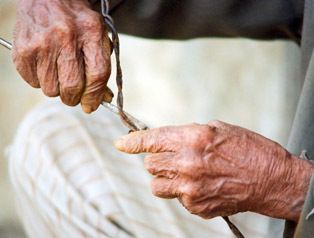 The hands of a wire-worker. This man collected old barbed wire (there was plenty) and made items that he could sell. 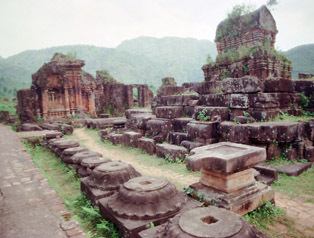 The Cham ruins were a few hours away by motorbike, but well worth the visit! 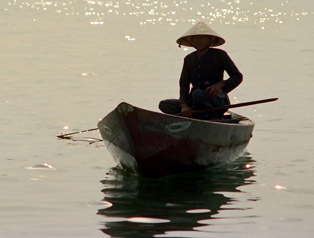 Hoi An was a photographer's paradise.